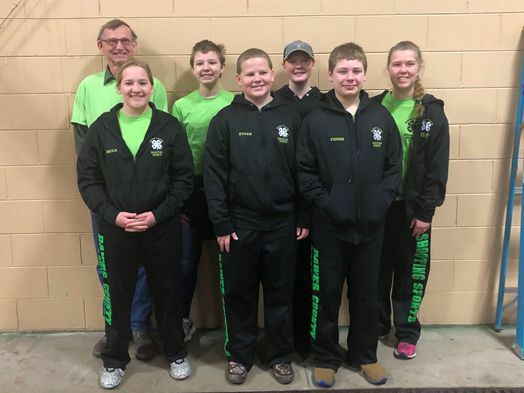 The Dawes State 4-H Air Rifle Team includes, back row, from left, Coach Roger Eaton, Alayna Hoffman, Samantha Johns, Kayley Galbraith; front row, Rebecca Menke, Ethan Johns, Alex Fisher. The Dawes State 4-H BB Team includes, back row, from left, Alayna Hoffman, Samantha Johns, Caden Galbraith, Coach Roger Eaton; front row, Ethan Johns, Alex Fisher, Kadence Fisher. 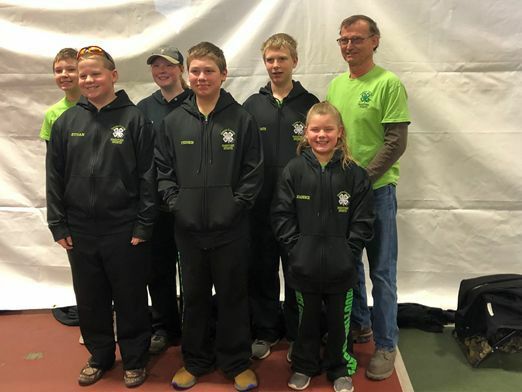 Multiple members of the Dawes County 4-H Shooting Sports Club competed at the 2019 State 4-H Shooting Sports competition in Kearney March 30-31. The Dawes County BB Team placed sixth overall out of 34 teams. Samantha Johns was sixth overall out of 167 individuals. The Dawes Sporter Air Rifle Team placed sixth overall out of 15 teams. Samantha Johns was 23rd overall out of 67 individuals. Complete results can be found on the Orion Results Center at http://www.orionresults.com/team/Home.aspx.